Schematic of the new street lamp. Credit: Optics Express. WASHINGTON, April 24, 2013—Streetlights illuminate the night, shining upon roadways and sidewalks across the world, but these ubiquitous elements of the urban environment are notoriously inefficient and major contributors to light pollution that washes out the night sky. Recent innovations in light emitting diodes (LEDs) have improved the energy efficiency of streetlights, but, until now, their glow still wastefully radiated beyond the intended area. A team of researchers from Taiwan and Mexico has developed a new lighting system design that harnesses high-efficiency LEDs and ensures they shine only where they’re needed, sparing surrounding homes and the evening sky from unwanted illumination. The team reported their findings today in the Optical Society's (OSA) open-access journal Optics Express. A unique feature of the new LED system is its adaptability to different street lamp layouts, “to all kinds of streets and roads, providing a uniform illumination with high energy efficiency,” says co-author Ching-Cherng Sun of National Central University in Taiwan. For example, some modern lamps that line a thoroughfare or suburban sidewalk lean into the middle of the road, lighting the street from above. But more often, lamps are posted to one side of a street, or alternating in a “zig-zag” pattern from one side to the other – a layout that may be more efficient for roads with high traffic flow. The new design provides flexibility to be used for different illumination requests while maintaining a high efficiency, Sun says. The proposed lamp is based on a novel three-part lighting fixture. The first part contains a cluster of LEDs, each of which is fitted with a special lens, called a Total Internal Reflection (TIR) lens, that focuses the light so the rays are parallel to one another instead of intersecting—a process called collimation. These lens-covered LEDs are mounted inside a reflecting cavity, which “recycles” the light and ensures that as much of it as possible is used to illuminate the target. Finally, as the light leaves the lamp it passes through a diffuser or filter that cuts down on unwanted glare. 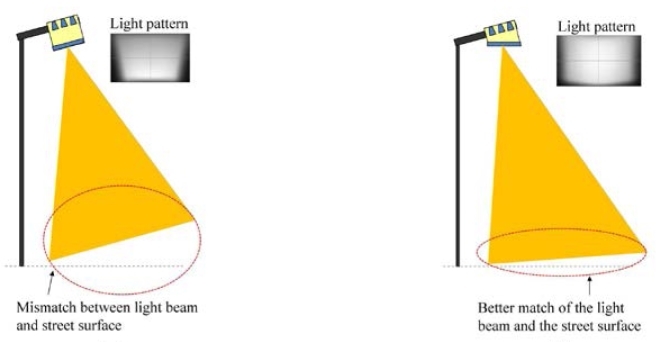 The combination of collimation and filtering also allows researchers to control the beam’s shape: the present design yields a rectangular light pattern ideally suited for street lighting, the researchers say. This photograph (left) illustrates some of the shortcomings of a traditional streetlight: light pollution, glare, wasted energy, and an uneven illumination of the ground. The perfect design for a streetlight (far right) would eliminate these problems. The team tested their design’s performance by analyzing how little the beam would spread as it hit its target—a road or sidewalk 10 meters or more away from the source of the light. They quantified the lamp’s performance using something called optical utilization factor (OUF), a number that describes the relationship between the flow rate of light at the target and the flow rate of light coming directly out of the LEDs. Higher OUF indicates better performance. Simulations show that the new design achieves an OUF of 51 to 81 percent, greatly outperforming a recent “excellent” design that reached 45 percent. Furthermore, the proposed streetlamp meets high expectations for power and brightness. And light pollution is also significantly reduced: for conventional street lamps, up to a fifth of their total energy is directed horizontally or upward into the sky. The best LED streetlamps reduce this to a tenth of their total energy. In the new model, just 2 percent of the lamp’s total energy would contribute to light pollution. In addition to cutting light pollution and glare, the new model could also save energy. “A general LED street light could reduce power consumption by 40 to 60 percent,” Sun says; the increased efficiency of the proposed design would likely save an additional 10 to 50 percent. Furthermore, he adds, the module would be simple to fabricate, since it comprises just four parts, including a type of LED bulb commonly used in the lighting industry. An example of the new design's adaptability: If an LED street lamp projected its light from the center of the street, the light pattern on the road would be a rectangle. If the lamp stands on the side of road, it projects its light at an angle, producing a trapezoidal light pattern. The new design includes alternative configurations that would maintain the light beam's rectangular shape for a lamp that must project its beam at an angle, ensuring an even illumination of the road. Sun’s team expects to finish a prototype of their design in the next 3 to 6 months, and to begin practical installations of the new street lamp as early as next year. 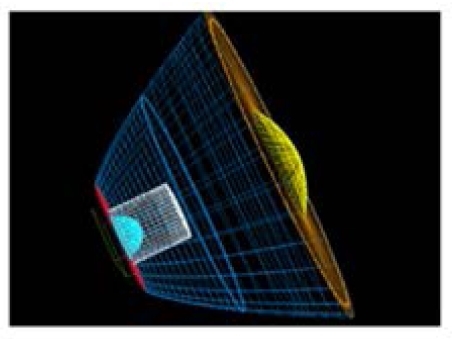 Paper: “High-performance LED street lighting using microlens arrays,” H. Lee et al., Optics Express, Vol. 21, Issue 9, pp. 10612-10621 (2013).